Leafy greens are some of the most nutritious, inexpensive and easy to cook real foods! They're also very tasty and very easy to cook. Leafy greens are available for a large part of the year in one form or another and are usually available at most farmers markets for great prices. • NUTRITIOUS- Lots of nutrients in just one serving! Vitamins, essential minerals, fiber and much more. • VERSATILE- Easy to add to lots of different recipes. Like smoothies for breakfast, salad at lunch, sautéed at dinner. • DETOX- High levels detoxifying, anti-inflammatory, and cancer fighting compounds. Not many foods can compare to the high nutritional value of dark leafy greens. Researchers are finding that eating your greens may be even more important than previously imagined. In putting together this article I found lots of quotes that stated "it was common for our ancient ancestors to eat up to six pounds of leaves per day". I could not find a accredited source for the quote but I can see that it makes sense. Recent research shows that a gene that is essential for producing critical immune cells in your gut, responds to the food you eat—specifically leafy green vegetables (Dr. Mercola). 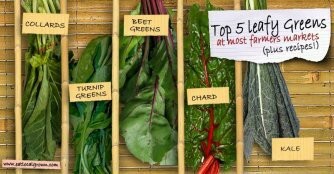 We now know that these greens contain an array of antioxidants and other disease-fighting compounds. Researchers also believe that these vegetables play an important role in controlling food allergies, inflammatory diseases and obesity, and may even prevent the development of bowel cancers (Walter and Eliza Hall Institute). • Showed evidence of significant protection against the occurrence of aggressive prostate cancer. • Glycoglycerolipids help protect the lining of the digestive tract from damage — especially damage related to unwanted inflammation. There are also many other dark leafy greens to add to your diet...consider alfalfa, wheetgrass, beet tops, mustard greens and the list goes on and on.